Wait…what? Didn’t I write an entire book on the late-round quarterback strategy? I did. But in my book, I also pointed out that you need to understand your scoring structure before you make any draft decisions. For instance, if your league favors quarterbacks with 6 points per touchdown pass, then you should strongly consider taking one of the elite ones in the first round. What seems like a slight variation makes a big difference. I’ve received a lot of questions on Twitter regarding non-standard leagues. “What about two-quarterback leagues?” or “What if my quarterback gets two points for every 35 yards passing?” In those cases, you need to change your draft strategy. Do a little math, and you’ll see why. For the sake of not boring you to death, I’ve decided to look only at two-quarterback leagues and show why the quarterback position becomes much more important in these structures. Once you get a hang of how this works, you can start to see how I would feel about other league types and scoring. Again, I’ll bring up the idea that you should never compare one position to the other unless you’re looking at a flex spot. For instance, we shouldn’t be concerned about how Aaron Rodgers performs against Arian Foster. We should be worried with how Aaron Rodgers compares to his peers, or other quarterbacks. If he outperforms his peers by an incredible number of fantasy points, then Aaron Rodgers is the most valuable player in fantasy football. The reason I’ve concluded that it’s smart to get running backs in the early rounds of draft is because more running backs are being started in a typical league. The same can be said for receivers. But at quarterback, you’re only typically starting one on each team. Or, in a 10-team league, you’re starting 10 total. This leads to less variation in points scored at the position. Historically, and with the exception of 2011, the difference between the top quarterback and the 10th ranked quarterback has been much smaller compared to the top running back and 20th ranked running back. It’s also been less than the variation between the top receiver and 20th ranked receiver. Hence, running backs and receivers are, in standard leagues, typically more valuable. But when you add another quarterback to the lineup, you’re stretching the number of starters from 10 to 20 in a 10-team league. And, in turn, you’re making the variation from best quarterback to worst quarterback much greater. The position becomes much, much more valuable. The best running back in 2010, Arian Foster, scored 330 fantasy points (standard scoring). The 20th best running back, or worst starter in a fantasy league, Frank Gore, scored 161 points. The difference between these two players was 169 points. We could consider that as the biggest advantage a team had at the running back position over another team. At receiver, Brandon Lloyd scored 209 points. The 20th receiver, Percy Harvin, scored 134. The variation at receiver in 2010 was a measly 75 points. And at quarterback in 2010, Michael Vick outscored the 10th ranked quarterback, Eli Manning, by 73 points using standard scoring. So, from a high-level, the value of the quarterback position in 2010 was less than the other two positions. Without getting into a debate about Michael Vick, or that the value of players doesn’t decrease or depreciate linearly, you must remember – this is a simple analysis to show what happens to a quarterback’s value with more than one in the lineup. In 2011, things were slightly different due to the increase in quarterback production. The best running back, Ray Rice, outscored Ahmad Bradshaw, the 20th ranked back, by 142 points. Calvin Johnson, the top ranked receiver, scored 118 more points than Dwayne Bowe. And at quarterback, we saw Aaron Rodgers score 144 more points than Mark Sanchez. Now, let’s assume that only one variable changes from the analysis above: There’s an additional quarterback started in each lineup. The running back and wide receiver point value analysis will remain the same, as we’re not doing anything to alter the demand of these positions. At quarterback, however, we’re no longer looking at the 10th ranked guy. We’re looking at the 20th ranked one. And when we do this, things change. In 2010, as I noted above, Michael Vick outscored the 10th quarterback by 73 points. But Vick outscored the 20th quarterback by 119 points. And in 2011, Aaron Rodgers increased his point difference to the worst starter from 144 to 226. In both instances, the number increased significantly. While 2010 still yielded a more significant point difference at running back, you can see how the value of quarterbacks changed with just one additional lineup spot. To put this another way, the demand of the quarterback increased. When you have more players started at a position, the demand for that position becomes greater because more owners need those players. It’s basic supply and demand. In this case, the supply of quarterbacks is less, causing the demand to increase. 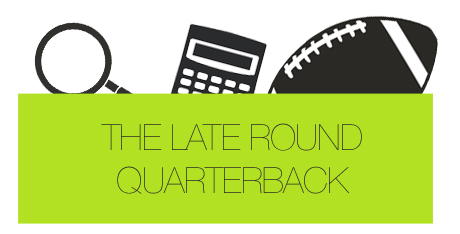 Instead of choosing 10 starting quarterbacks out of a 32-quarterback pool, you’re choosing 20. There are then, in turn, less quarterbacks to choose from when it’s your turn to draft. That’s why you need to get one early – so you know you won’t get stuck with a low-end guy. If the 20th ranked quarterback scored just a few points less than the 10th ranked quarterback, then there would be less need to draft a quarterback early. But because the variation of best to worst quarterback increases when you add an additional quarterback starter, you should look at drafting an elite quarterback early in multi-quarterback leagues. Be cautious, of course. If you’re sitting at pick 8, and the first 7 picks were quarterbacks, don’t force yourself to get a quarterback. All you’d be doing is devaluing that draft pick with a player that should go later in the draft. Be smart, and use value based drafting to help make your draft decisions. As with all draft strategies, you must be flexible. Rank your players according to the demand of that position in a particular league, and go from there. Don’t force yourself into a situation because a strategy tells you to. After all, every player has value somewhere in a draft.